The Unified Inbox collects and displays all social media messages, comments, and notifications in one location. Once the user reads or responds to the message, it can be marked as completed and be hidden from the Inbox view. Users can also create customizable tags to keep track of important notifications, comments, and messages, apply filters to view items of interest, search for a specific item, and much more. Currently, the Inbox supports Twitter, Facebook, Google+ and LinkedIn, but the company plans to add support for several more social networks. The founders, Gilad Salamander and Tal Mikaelovich, have been working on eClincher’s social media management platform for more than two years and are excited to offer the Unified Social Inbox to their customers. For more information about eClincher, visit www.eclincher.com. eClincher is a social media management platform that helps businesses manage and organize their social media presence in a straightforward and easy-to-use application. 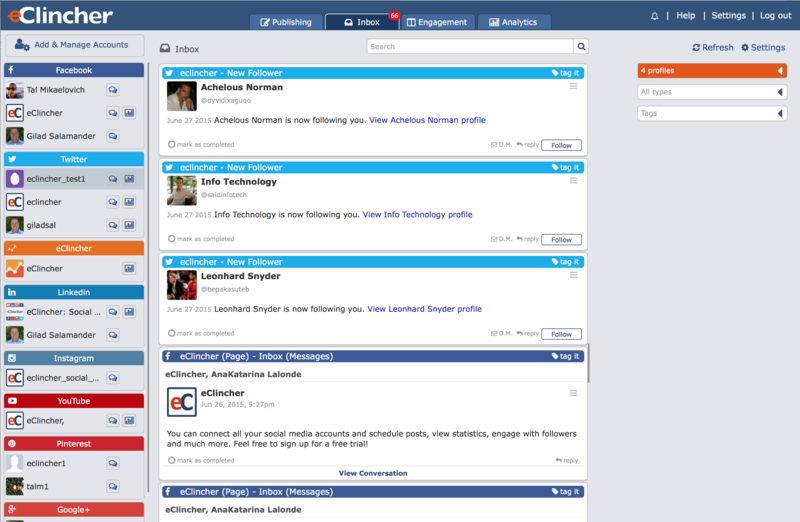 eClincher's features include publishing and scheduling content to multiple social accounts, monitoring, engagement, a unified social inbox, and complete social and website analytics.